Retino A or Tretinoin gel ??? Just wondering if there is a difference between these two? I have many acne scars and have been dermarolling for a few months. I do get the occasional acne but not as much as I used to. Therefore, was wondering if it is a good idea to use any of the above gels on the days that im not dermarolling - as suggested by you in another thread. But which one? First things first, what is your skin type? One is a prescription and the other is not. If you want to treat acne, your first line of defense and "gold-standard" is benzoyl peroxide hands down. Go easy and be patient with 2.5% benzoyl peroxide along with 0.5-2% salicylic acid exfoliant products. You should check out the acne thread I made. •Retin-A has a lightweight cream texture and is most often prescribed for acne. •Renova has an emollient texture and is prescribed for wrinkles/sun damage. •Atralin, Avita, Altinac, Refissa, and Tretin-X are other prescription-only products with tretinoin. Retinol is very popular and is available in many local drugstores and department stores. Its known cosmetic range of potency is around 0.1-1.0%. It can also cause irritation depending on potency. An affordable option for normal to dry skin is Neutrogena Healthy Skin Anti-Wrinkle Cream, Night. For oily skin, you may like Paula's Choice Skin Balancing Super Antioxidant Mattifying Concentrate Serum. Want a higher-end retinol product? Try SkinMedica Age Defense Retinol Complex for normal to dry skin types. For all skin types, you may prefer SkinCeuticals Retinol 0.5 Refining Night Cream OR SkinCeuticals Retinol 1.0 Maximum Strength Refining Night Cream. If you have sensitive skin (i.e., easily inflammed, stinged, etc), then you want to considered a nonacidic form of vitamin A like retinyl acetate or retinyl palmitate. Retinyl palmitate is less effective because it needs to be broken down several time. According to smartskincare.com, Dr. Torodov states, "Not all forms of vitamin A are created equal. Some are more easily converted to retinoic acid than others. A typical conversion pathway looks like this: Retinyl palmitate <=> Retinol <=> Retinaldehyde => Retinoic acid" (LINK). I am not aware of how many times retinyl acetate needs to be broken down. Sarah sells an affordable ointment, Infadolan, with 0.1% retinyl acetate that is best applied after derma rolling to provide a protective barrier along with the cell communicating benefits of Vitamin A & D. This product may not be right for everyday use for your skin if you happen to be very oily and acne-prone, so I suggest you only use it a day or two after rolling for caution sake. No, retinol and tretinoin are NOT the same thing. They both their own unique chemistry. Retinol is the alcohol version of vitamin A. Tretinoin or all-trans-retinoic acid is the acidic version of vitamin A and most active, meaning it does not need to be broken down further to communicate with the skin cells. I say you forcus on acne with non prescription method first like benzoyl peroxide and salicylic acid. Yes, using Retinol or Tretinoin before derma rolling will definitely help with better collagen and elastin development. Sarah does not advise (and I am with her on this) applying Tretinoin right after rolling because it can redden and sting your skin badly, that is why you should go with Infadolan ointment afterward. Or, if you want something super cheap just apply 100% Petrolatum from Vaseline. But remember there are other ways to promote collagen production, too! Vitamin C, for example you can DIY with Sarah's powder and bottle. You need to maintain a well designed skin care routine to see best possible result! Don't forget about your sunscreen, that is the big one. When you say you have enlarge pores, that usually if not most likely is an inidication for oily skin if not oily T-zone. What products are you using sid? What skin color are you? What is your skin care regimen? Do some preliminary research on wikipedia: Tretinoin AND Retinol . Great! I'll order the tretinoin gel from Sarahs website as all my derma rolling products are bought from her. U didn't mention anything about copper peptides? This thread is on Vitamin A, so I didn't really felt like elaborating every ingredient on collagen promotion. I am glad the contraceptive has worked. I think you have enlarged pores probably because of lact of collagen around the pore so you should benefit fromd derma rolling. Or, it could be years of excessive oil product that expand your pores. Copper peptide is also a great option for collage production, but I see it more as skin remodelling for scar management. 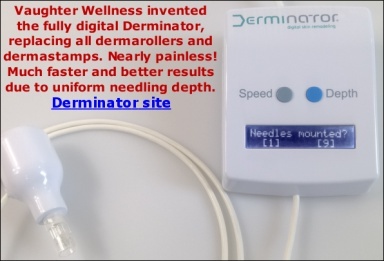 You should benefit from copper peptide if you intend to treat scars with derma roller (1.5mm best). Of course dont forget a wel designed skin care routine. Dermalogica sells pricey products, but I guess you can afford it so OK. but just so you know you can buy most of your products from the drugstore and sarah's website. Do you know Paula Begoun? She reviewed the skin care line and does not recommend a lot of its products due to the inclusion of certain plant extracts and essential oils that she finds irritating, phototoxic, and/or cytotoxic. I am dealing with enlarged pores, too, you are not alone! What you really should focus on well-rounding skin rejuvination are these KEY ingredient: an AHA or BHA exfoliant (enhance penetration, collage production, etc), retinoid or Vitamin A derivative (cell-communicating benefits, collagen production,etc), L-ascorbic acid or Vitamin C derivative (antioxidant benefit, depigmentation, collagen production, etc), GHK-Cu (skin-remodelling, anit-inflammatory, collagen production, etc), And SUNSCREEN (a must for a life time, to maintain result)!!!!!!!!!! Oh and Sid, wait until you get a word from Sarah before you buy her products. I don't want to be the reason you buy anything, I'm scared LOL. You should wait. You should get more accurate production suggestion from her own line. Retin-A contains all-trans Retinoic acid (= Tretinoin). SarahVaughter;1122 wrote: Retin-A contains all-trans Retinoic acid (= Tretinoin). Thanks Sarah...that's all I wanted to know. Just going to buy the cream and some peptide masks from ur website. Hi Sarah....just a quick question.will the retin a gel help with under eye dark circles? If not is there anything you can suggest please. Much appreciated. Sid;1128 wrote: Hi Sarah....just a quick question.will the retin a gel help with under eye dark circles? If not is there anything you can suggest please. Much appreciated. 3) Loss of fat under the eye, making the area hollow and shadowy. 1) Bleaching creams or mild acid peels. Do not use Tri Luma since it contains a steroid and that might thin the skin even further. Fillers. Vit. K supposedly breaks down hemosiderin but whether the circles are caused by hemosiderin deposits is not confirmed. You can try vit. K creams with a 0.20 or 0.25 mm roller." (The effects of topical application of phytonadione, retinol and vitamins C and E on infraorbital dark circles and wrinkles of the lower eyelids" that concludes "Topical application of the gel containing 2% phytonadione, 0.1% retinol, 0.1% vitamin C and 0.1% vitamin E was fairly or moderately effective in reducing dark under-eye circles, especially in cases of haemostasis, over a short treatment period in healthy Japanese adults. This treatment also slightly decreased wrinkles". So... if you want to venture for vitamin K, you can try Pond's Age DefEye Anti-Circle Anti-Puff Eye Therapy with Vitamin K & Anti-Oxidants OR medik8 Red Alert, Spider Vein Treatment, Anti Redness Cream (this contain 8% vitamin K, BUT I am not sure if it is the same form as the one used in the study).